But there’s a big hang-up: solar energy doesn’t provide a 24-hour supply. When the sun sets, the power from solar farms drops off, just as California needs it most. That’s sparked new interest in technology that stores electricity. And the energy storage technology race is going far beyond your typical battery. “Pretty much everyday, we hit peak output,” says Michael Wheeler, a vice president at Recurrent Energy in San Francisco, looking at a screen showing the solar farms his company manages. But earlier this spring, something happened that, at first, doesn’t seem to make sense. It was the middle of the day, when one of the solar farms was cranking out electricity, and his company got a message. “The grid operator is telling us they don’t need all of it,” Wheeler says. There was too much electricity on the grid. The electric grid managers were telling solar farms to shut down. “The project went from almost peak output to zero for about two hours,” he says. This happens on sunny, spring days when there is plenty of solar power but Californians aren’t using a lot of air conditioning yet, so demand for power is low. The solar and wind power comes in on top of what natural gas power plants are generating. Because renewable energy production goes up and down with passing clouds and wind conditions, grid operators say they need the continuous supply from natural gas to make up for those fluctuations. Shutting down natural gas would leave the power supply less stable. Many gas plants can take between four and eight hours to restart, once they’re turned off. As more solar farms come online, the pressure to shut them down on mild, sunny days is only expected to become greater. California plans to get 50 percent of its electricity from renewable sources by 2030. California’s grid operators have proposed linking the state’s grid to other Western states, so the excess solar energy could be shared. Another solution is to store the solar energy, because there’s an obvious need for power in the evening, right as the sun goes down. “Everybody comes home from work and they turn on their lights and that uses a lot of power,” says Shayle Kann who analyzes renewable energy at Greentech Media in Boston. California’s electricity demand peaks in the evening. Storing solar power for just a few hours would allow solar farms to help meet that peak. Since California regulators don’t want to see solar farms turn off, they’re requiring utilities to build energy storage on the grid. 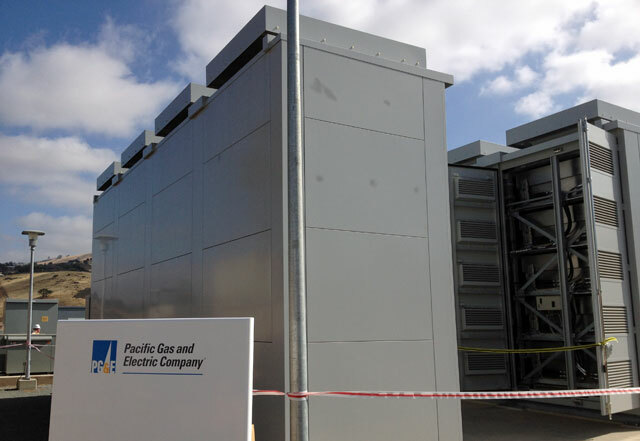 All together, Pacific Gas & Electric, Southern California Edison and San Diego Gas & Electric must install 1.3 gigawatts of energy storage by 2020, which is about the same as a couple power plants. That mandate is the first of its kind in the country. So far, batteries have been the dominant technology. There are a handful of large banks of batteries on the grid already, some the size of a semi-truck, which can store electricity for several hours. Batteries are coming down in cost dramatically, but they’re still relatively expensive compared to other sources of power. That’s launched start-up companies looking for a different way to store energy. 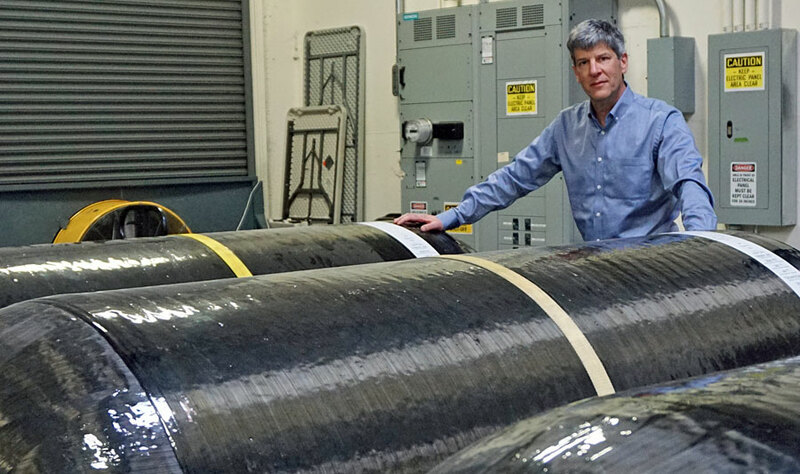 “So what you’re looking at, really, is best described as a giant scuba tank,” says Steve Crane, pointing to a 25-foot tank in the warehouse of his company, LightSail Energy in Berkeley, California. A scuba tank is the inspiration for his technology, which compresses air. Here’s how it works: when there’s extra electricity, Crane turns on a giant air pump. It fills the tank, compressing the air by 200 times. Then when electricity is needed, the air is released to drive an electric generator. The hard part has been dealing with all the heat this makes; Crane’s technology uses water to capture some of the heat. The idea of storing energy by compressing air isn't new, but other projects have stored the air in large underground caverns. By using tanks, LightSail's technology would be more modular. It's still in the early stages, with the company working on its first pilot projects. But Crane hopes it will have an edge over batteries, because it’s likely going to be cheaper and it lasts longer. “If you have a laptop or cell phone," he says, "you know that after two to three years, you start to see significant deterioration." Crane says interest has sky-rocketed for energy storage technology like his and other other non-battery approaches, such as ice, molten salt or mechanical machines called flywheels. Research and development can take years and venture capital firms like to see faster results. But if California is to meet its ambitious renewable energy goals, energy storage technology will have to catch up.